2019 Schedule will be available soon! Join us (loyal members don't forget to renew)! Membership form for 2019 is here. Welcome to 2018!! We have a fun filled season planned ahead of us which I hope you will all enjoy! 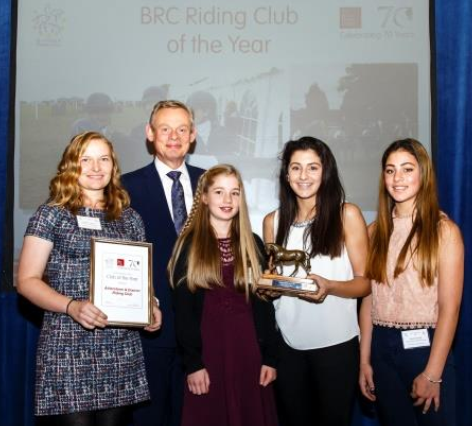 2017 was simply amazing with the Club being awarded British Riding Clubs, Club of the Year for most points awarded at Championship Level. We had representatives at every Championship last year and nearly all were placed. The Juniors dominated their sections at Qualifiers and were all placed respectably at Championships. What I feel is more important was the team spirit, the support shown to each other and the fun we all had in the process, which is what Riding Clubs is all about. We have a new Facebook page which is regularly updated with any training dates, show schedules and any other info we think is important to you so make sure you are following us! Last year we enabled many people to achieve a lot of firsts. First time going cross country, first time doing a dressage test, first time in the main show jumping ring, first time showing, first time at qualifiers and first time at Championships. Everyone has different goals and aspirations and I feel as a club our aim is to help everyone achieve them. Once again we have run dressage and jump training through the winter and will continue all summer. There will be “Day Rallies”, clear round days, one-to-one and group training sessions as well as all the fantastic competitions. So why not make this year the year of achieving firsts? Personally I am choosing Dressage to Music as I have not competed at BRC Dressage to Music and would really like to (I’ve done all the other qualifiers why not that one!). As you all know these events do not run themselves, the committee continue to work tirelessly to keep things running smoothly and to provide you with as much opportunity to enjoy your horses as possible. We have welcomed some new committee members this year and also said goodbye to a few, we wish to thank those for the years of supporting the club and hope they won’t be strangers (there’s always cake on offer!). So if you have any spare time through the summer and are able to help at any events in any capacity (even making the tea or producing posters or course plans, or providing the greenery to dress the fences!) Please get in touch! Many hands make light work and it’s amazing what a difference one person can make! Enjoy 2018 folks! Let’s make this year even better than the last! If you like the new site please recommend it to your friends. For Facebook you can "Like" or "Send" to selected friends using the buttons below. If you have ideas or suggestions for improvements, or you have photos or a write up of an event or anything else you think may be of interest please contact the webmaster. If you dont like the site, tell us how we might fix it, contact the webmaster.